A six-decade-old crocodile tannery which is a supplier to European fashion houses such as Louis Vuitton; a 77-year-old company which last year saw worldwide sales of 250 million bottles and cans of its cooling water from a 1937 recipe meant for coolies. These home-grown brands - Heng Long tannery and Wen Ken Group's Three Legs Cooling Water - may have made their mark overseas but not many Singaporeans know of them. 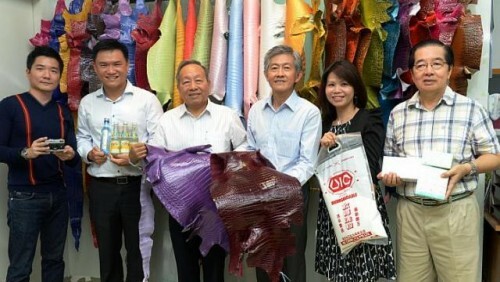 "Few Singaporeans realise that if they own a crocodile-skin bag it was most likely dyed in their very own backyard," said Heng Long's executive director Koh Choon Heong. An exhibition called 50 Made-in-Singapore products by the National Heritage Board (NHB) hopes to change this. Slated to open at the National Museum of Singapore in September next year as part of the nation's golden jubilee celebrations, the exhibition will feature these brands alongside Axe Brand Universal Oil, Boncafe Coffee and Tiger Brand soya sauce and chilli sauce. Mr Alvin Tan, group director of policy at NHB, hopes the exhibition will raise public awareness and appreciation of Singapore's home-grown products. "Many of these products are excellent examples of Singapore's early pioneering spirit and showcase how perseverance and inventiveness can ensure product longevity," he said. Mr Tan's team started their research project in 2012 by scouring old advertisements, newspaper articles and company annual reports for locally made products that could tell the story of the growth of the Republic's manufacturing industry. Just seven were confirmed last October but over the past few months, more companies approached the board expressing interest in joining the exhibition. From a list of 75 companies, 50 eventually made the final cut. They include third-generation family business Chop Wah On, Singapore's oldest medicated oil and balms company. Its founder, merchant Tong Chee Leong from Guangzhou, China, first set up shop in Chinatown in 1916 where he concocted medicated oils such as red flower or citronella oil for the Chinese immigrant community. Today, the company has expanded its range to 17 products, including a nutmeg cream and eucalypthol balm, which helps with cold symptoms for instance. These are popular with tourists. To cater to this demand, Chop Wah On started selling its products at a pharmacy at Changi Airport's departure lounge in Terminals 1 and 2 last month. Its director Tong Kok Kai said it is ironic that its goods are better known in countries such as China, Germany and Canada. To raise awareness about his grandfather's legacy, Mr Tong approached NHB to take part in the exhibition. "We want to share with Singaporeans the story behind our heritage brand... and be part of the exhibition to help Singaporeans appreciate local gems and the Singaporean spirit." Urban historian Lai Chee Kien is pleased that the list includes many small and medium-sized home-grown companies, many of which produce quality products. Medicated oils sold in Hong Kong, for instance, are often packaged to look like they are made in Singapore. "Featuring these enterprises will help Singaporeans appreciate the parallel importance of the island as an entrepot, and their history and regional impact." One of the three largest exotic skin tanneries in the world, supplying fashion houses in Europe for decades. In 2011, French luxury conglomerate LVMH Moet Hennessy Louis Vuitton bought a majority stake in the company, which traces its roots to 1947 when Koh Long Cheok and his fisherman father sold watch straps, belts and souvenirs to British forces from its tannery in Tampines Road. Concocted in the late 1930s by the Wen Ken Group, the drink was targeted at coolies suffering from "heatiness". It was cheaper than visiting a Chinese physician. Last year, 250 million bottles and cans were sold worldwide. Singapore's oldest medicated oil and balm company was set up in 1916 in Pagoda Street. Its products include crocodile oil for skin-related ailments. Established in 1964, it is known for its powdered laundry detergent and infectious jingle, as well as UIC Big Value, Spin and Sofsil, a fabric softener.